Infusions are a great was to amp up the flavor to your favorite drink without adding additional sugar or calories. I started making homemade infused alcohols when I realized many of the ‘infused’ liquors on the market are full of extra stuff. Like chemicals or the above mentioned dreaded sugar! The realization popped up while looking at a popular honey whiskey. It is in fact not honey infused whiskey, but a honey liqueur with a splash of whiskey! Say what?! After that mason jars full of flavor concoctions started popping up all over our kitchen. Read more about my homemade infusions tips and tricks in this article. 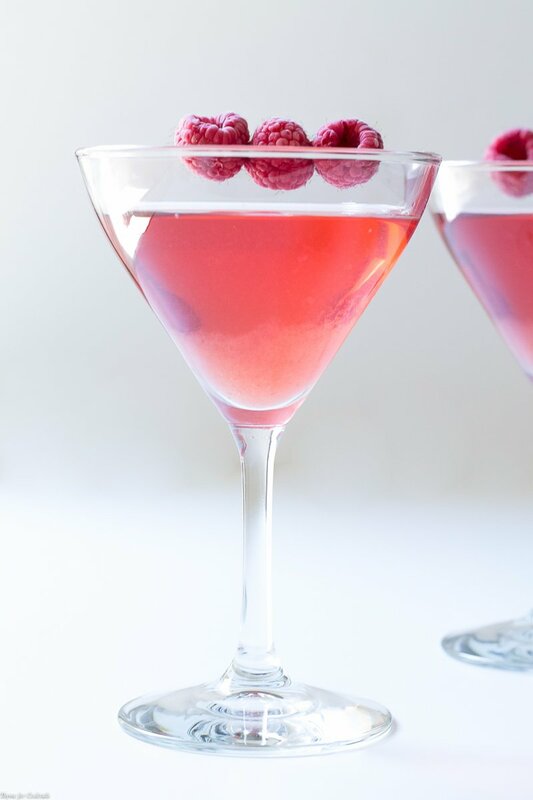 In the meantime though let’s talk about this Raspberry Gimlet recipe. To me gin has always been a liquor you either love or hate. In a nut shell this clear alcohol starts out pretty similar to vodka. While vodka is a near flavorless spirit though, gin is singularly categorized by the addition of juniper berries. That is why gin has a strong floral note. Those botanicals are why gin can be trickier to infuse with other flavors. If this is your first go at making a homemade liquor infusion you could try vodka instead of gin. Now if you are already a gin-lover then have fun! Also please start small. It’s too easy to waste an entire bottle of booze on a botched infusion. Start with 1 cup liquor and be sure to write down the measurements for your other ingredients. If it works about you can make a bigger batch the next time. If playing around with alcohol infusions is your thing, then grab the recipe for this Raspberry Infused Gin below. 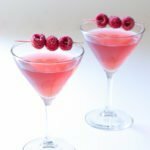 After that jump over to the SoFabFood site for the full Raspberry Gimlet recipe along with a few helpful tips! I hope you like this Raspberry Gimlet recipe as much as my crew does. If you love this seasonally inspired drink recipe, you can find more like it by checking out my Cocktail section! For recipe inspiration delivered to your inbox, subscribe to my newsletter, follow my photography journey on Instagram, and for generally inappropriate humor follow like me on Facebook! Add gin and berries to a large lidded jar. Close tightly and place in the refrigerator for 3 days. Shake occasionally to blend flavors. Taste mixture to test strength. Continue to check every day until desired flavor is reached. Strain fruit from infusion using cheesecloth and a fine mesh strainer. Store infused gin in a closed jar in the refrigerator until it's gone. Tip - Liquor infusions that contain perishable items such as fruits, herbs, or botanicals should be store closed in the refrigerator. Infusions with non-perishables such as spices, dried chiles, or coffee beans can be stored in a cool, dry place such a closed pantry or cabinet. 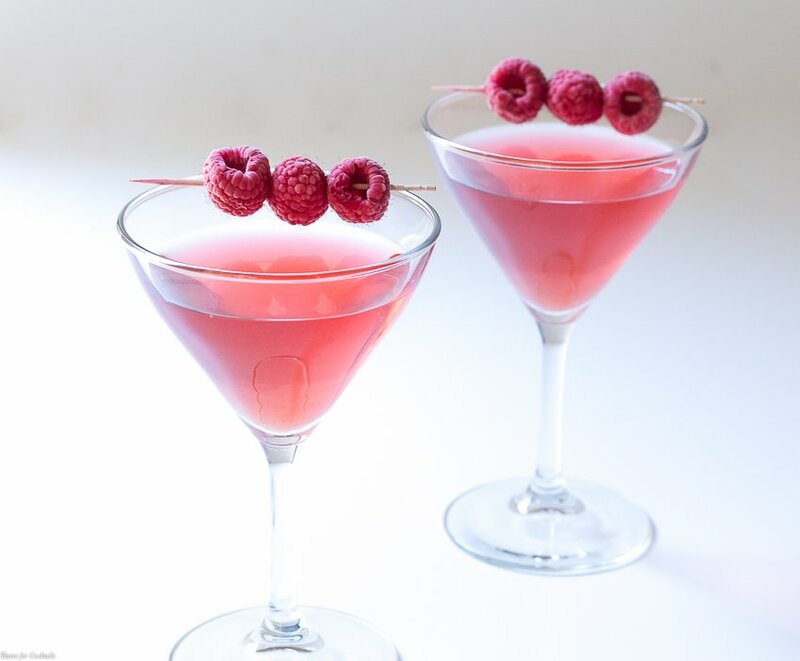 The full recipe for recipe for my Raspberry Gimlet can be found on the on the SoFabFood site.